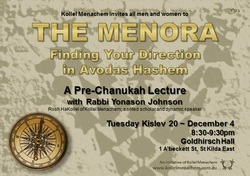 The festival of Chanukah is intimately connected to the Menora. The Menora has been a symbol of the Jewish people for thousands of years. Its design and placement in the Beis HaMikdosh embodies the spiritual aspirations of our people. 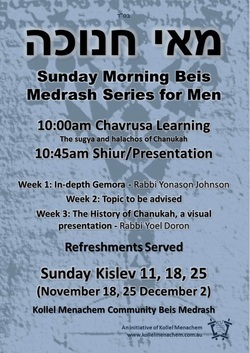 Join Rosh HaKollel, Rabbi Yonason Johnson on a fascinating journey. By drawing on sources from Talmud, Kabbalah and Medrash, discover how the Menora serves as your compass in navigating the paths of Avodas Hashem (Divine Service). The name Chanukah is connected to the word Chinuch - Jewish education. The triumph of our people over the Greek empire was a victory for the eternal chain passing Torah from one generation to the next. In more recent times, the 19th of Kislev saw the release of the Alter Rebbe from prison and a new era in the spreading of Chassidus. 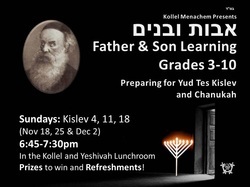 Fathers along with their sons are invited to join in a special 3-week series of Father and Son learning in preparation for these 2 special festivals. Strengthen the chain and pass on the eternal value of Torah study to your next generation. Refreshments and prizes to be won. Starting Sunday November 18. Click the picture (left) for full details.